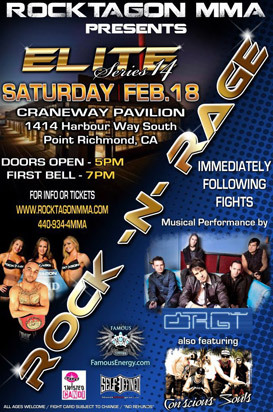 We’ll be heading to Richmond tomorrow to cover the Rocktagon event at the Craneway Pavilion. I’ll be posting live round-by-round action. So if you can’t make it, you can follow your favorite fighters here. WE GIVE YOU THE RESULTS BEFORE ANYONE ELSE! Rocktagon states Neal will be defending his Rocktagon featherweight championship belt. The 25 year-old Neal is 4 – 0. He won his last fight by KO in the 1st round, and the remaining fights by decision. He comes from Hayward and lists his fight team as True Fight Club. The 5′ 7″ and 27 year-old Perez is 2 – 1 – 1, his 2 wins were by unanimous decisions and his loss was by submission. He received a draw for his last fight He fights out of Gilroy and lists his fight team as Antdawg’s USH. Rocktagon states this fight is for their light heavyweight belt, although Camo lists this as a welterweight fight. The 5′ 11″ and 22 year-old Wallace is 2 – 1, with 1 win by submission in the 2nd round and 1 by KO in the 1st round. The loss was by unanimous decision at the Slugfest promotion in Oakland on 10/22/11 (click to see our photos of this event). Wallace is out of Oakdale and lists his team as (Oakdale MMA) Last Stand Fight Team. The 5′ 9″ and 23 year-old Bryson has not fought in a Camo event. Bryson is from Santa Maria and lists is association with SMAC. According to Rocktagon, Bryson is a Marine veteran with military combatives experience and is a two-time Greco-Roman wrestling champion (they don’t say what championship). Mefi Monterroso (0 – 1) vs. Dustin Moore (1 – 3) – flyweight fight. Vincent Vinuet (2 – 4) vs. Curtis Palmer (0 – 0) – welterweight fight.